President of the Republic of Azerbaijan Ilham Aliyev`s meeting with Prime Minister of Armenia Nikol Pashinyan to discuss the settlement of the Armenia-Azerbaijan conflict in Vienna continues. Azerbaijani President Ilham Aliyev and Armenian Prime Minister Nikol Pashinyan first held a one-on-one meeting. The meeting is currently underway with the participation of the OSCE Minsk Group co-chairs. President of the Republic of Azerbaijan Ilham Aliyev and Armenian Prime Minister Nikol Pashinyan have held one-on-one meeting in Vienna, Austria. 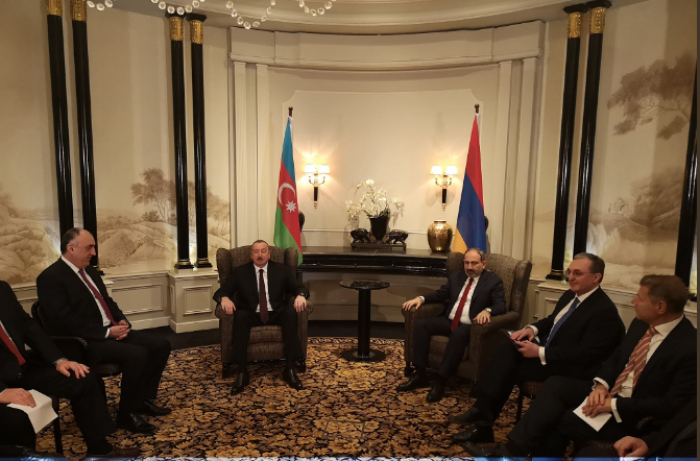 Before the one-on-one meeting, Azerbaijani president and Armenian PM have met with the Personal Representative of the OSCE Chairman-in-Office Andrzej Kasprzyk, co-chairs of OSCE Minsk Group, as well as Azerbaijani and Armenian FMs. Note, OSCE Minsk Group Co-Chairs will make a joint statement on the results of the meeting. A meeting between Azerbaijani President Ilham Aliyev and Armenian Prime Minister Nikol Pashinyan kicked off in Vienna, Austria by the mediation of the OSCE Minsk Group co-chairs, AzVision.az reports. The meeting will last two hours.